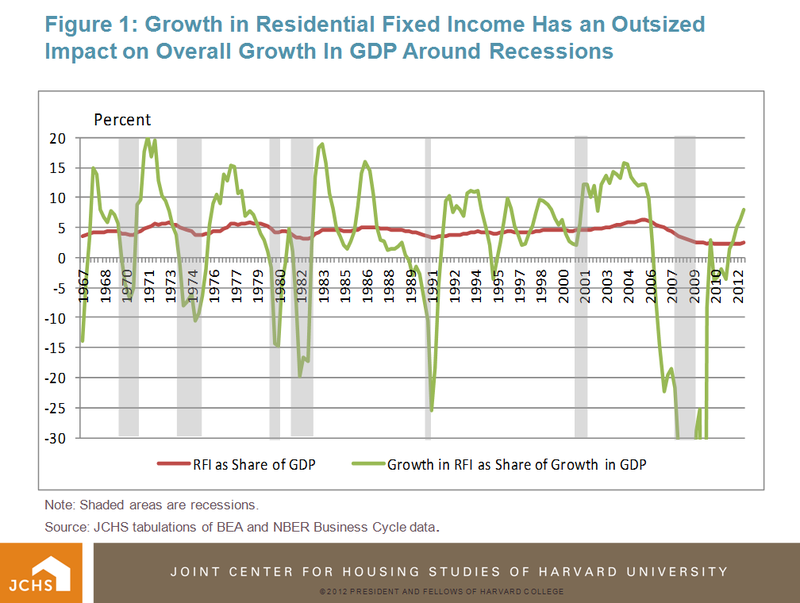 The most direct measure of housing’s impact on the economy is Residential Fixed Investment (RFI). RFI includes spending on construction of new housing units and manufactured homes, as well as improvements spending, brokers’ commissions on the sale of residential property, spending on some types of built-in equipment (such as heating and air conditioning equipment), and also net purchases of residential units from the government. In any single period of time, RFI is a modest part of the total output of the US economy as measured by gross domestic product (GDP). According to the US Bureau of Economic Analysis’s National Income and Product Account (NIPA) tables, which provide quarterly GDP data for most series dating back to 1947, RFI has on average represented just 4.2% of the economy. In terms of economic growth, however, growth in RFI can have influence that far exceeds its share of the economy (Figure 1). 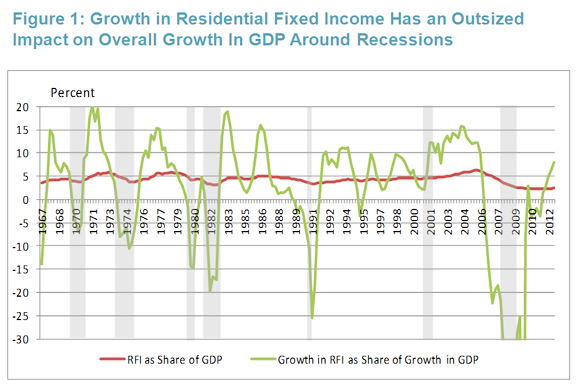 This is particularly the case in the time periods around recessions, when decline or growth in RFI can account for 15 or even 20 percent of overall decline or growth in GDP – enough to push the economy into or out of a recession (see Leamer (2007) “Housing IS the Business Cycle“). Prior to the Great Recession of 2007-9, for example, the preceding downturn in RFI alone shaved fully 1 percentage point off of GDP. Note: Shaded areas are recessions. Source: JCHS tabulations of BEA and NBER Business Cycle data. In the five recessions that occurred prior to the Great Recession between 1970 and 2001, housing construction was both a drag on the economy leading into the recessions and a buoy immediately afterwards (Figure 2). 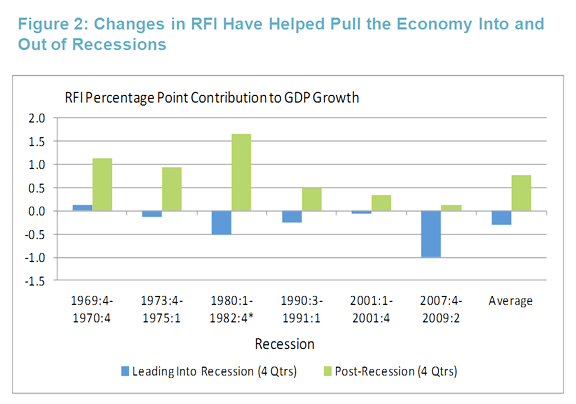 In the four quarters leading into each of these recessions, RFI’s contribution to GDP growth was normally negative, ranging from a mild -0.1 percentage point prior to the 2001 recession up to a half a percentage point drag on GDP prior to the 1980 double-dip recession. Following these recessions, RFI’s influence not only returned positive, but its positive contribution to GDP growth generally skyrocketed to several multiples above normal. The average percentage point contribution of RFI to GDP growth ranged from 0.3 to 1.1 percentage points in the first year after each of the past five recessions. Such growth in RFI during those periods equated to about one-fifth of all GDP growth at the time - a nice boost to the economy. 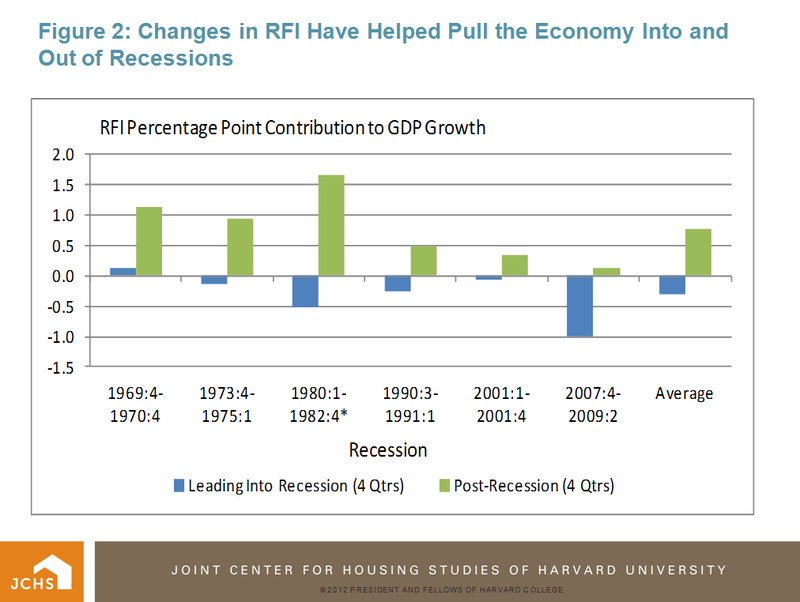 RFI’s positive contribution to GDP following the Great Recession has been nowhere near those seen after past recessions. As shown in figure 2, while RFI’s drag on GDP heading into the Great Recession exceeded that heading into any recession since 1970, RFI provided just 0.1 of a percentage point to GDP in the first four quarters after the recession, and was still providing negligible impact fully nine quarters after the recession officially ended. However, the third quarter of 2012 marks 13 quarters after the Great Recession, and RFI’s impact to GDP over the past year has been consistently positive on the order of 0.3 percentage points, or about 12 percent of current GDP growth. With housing construction starts rising, the positive economic contributions of RFI will follow.